Please join us on Wednesday, July 3, as we celebrate our nation’s independence with our annual fireworks display and community celebration! This year's event is presented by Cherry Hill Township in partnership with the Cherry Hill Mall. The gates to the Jonas Morris Football Stadium at Cherry Hill High School West will open at 7 p.m., and will stay open until 8:45. 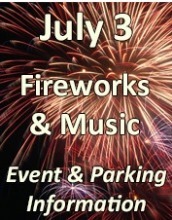 Guests will enjoy live music from the local band “No Commitment” beginning at 8 p.m.; fireworks will begin at 9. As always, admission is free; proceeds from all refreshments sold will benefit Cherry Hill West. This year, we have posted important event information -- including maps of parking areas and road closures -- on the Township website; click here for details. Please remember that alcohol, smoking and glass bottles are strictly prohibited, and all bags, backpacks and coolers will be subject to search upon entry. Please adhere to the posted guidelines, and arrive early to ensure easy entry for you and your family. Thank you in advance for helping to keep this family-friendly event enjoyable for everyone. This past Wednesday, I joined members of Township Council, Camden County Freeholder Jeff Nash, and residents of Erlton South to celebrate the start of summer in the newly renovated Erlton Park. 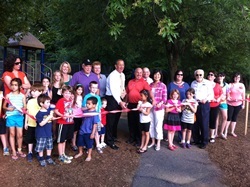 With the help of a $25,000 grant from the Camden County Freeholders, the park received quite a facelift this spring: the Township was able to install new swings, exercise equipment, play equipment for children ages 2 to 5, and new landscaping throughout the park. Both the tennis court and softball field were resurfaced, and new tennis, basketball and hockey nets were installed. Mr. Softee treated guests to a few sweet, summertime treats, and the neighborhood kids had a great time on the J-Dogs moon bounce. Cherry Hill Township is continually looking for ways to enhance our recreational offerings, and we always welcomes residents' feedback. If you have questions or suggestions about a park or playground in your neighborhood, please share them with the Department of Recreation by emailing Recreation@chtownship.com. Thank you - and have a great summer! This week, seven Cherry Hill Police Department recruits graduated from the Camden County College Police Academy. This year's graduating officers took home several awards, including vehicle operations awards given to Officers Anthony Amato and Greg Brisbin; a leadership award, given to Officer Matthew Lilley; and the Thomas J. McDonnell Award, given to Officer David Plummer, as the recruit who best exemplifies the standards of the law-enforcement profession. Congratulations to these officers, and to Officers Matthew Calloway, Jonathan McSorley, and Justin Hunter. 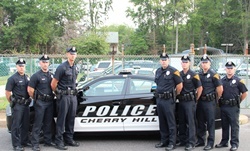 The men and women of the Cherry Hill Police Department continue to make us proud every day of the year. Please join us tomorrow at 11:30 a.m. as Cherry Hill Township and Cherry Hill National Little League welcome a group of 11-year-old baseball players from Newtown, Ct., into our community. The players are in town to see the Philadelphia Phillies - but before they had to Citizens Bank Park, they'll join National's 11/12-year-old tournament team for a scrimmage at National's field on Cooperlanding Road. There's no doubt that the Newtown community has been on our collective minds since last December -- please join us tomorrow morning and help give them a warm Cherry Hill welcome. We hope to see you there! Cherry Hill's storied Babe Ruth league will take the field in one of Cherry Hill's premier athletic facilities next year. And on Thursday evening, Council and I were delighted to help rededicate the Babe Ruth field -- located behind Town Hall on Mercer Street -- as "Foulke Field," in honor of the man whose generosity made the field's extensive renovations possible. 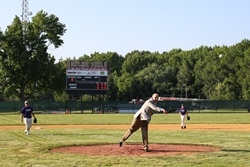 The field now bears the name of Charlie Foulke Jr., a longtime Cherry Hill resident and owner of several local car dealerships, whose son funded a complete overhaul of the 30-year-old field. Renovations included a re-sodded field, a beautiful new outfield scoreboard, new dugouts and an upgraded field house. It was a wonderful evening for our entire community, and I was proud to be a part of it. The new field will make play safer and more enjoyable for Cherry Hill's Babe Ruth players today, and for generations to come. Tomorrow at 10 a.m., members of Council will join the Camden County Freeholders, special needs children and community volunteers to mark the opening of Boundless Field, a new athletic field that allows children with disabilities to play baseball and other organized sports on a playing surface that can accommodate their special needs. Boundless Field is located next to Jake's Place Playground at Challenge Grove Park, at the corner of Brace and Borton's Mill roads. This year, we have posted important event information -- including maps of parking areas and road closures -- on the Township website; click here [http://www.cherryhill-nj.com/DocumentCenter/View/1771] for details. This past Wednesday, I joined members of Township Council, Camden County Freeholder Jeff Nash, and residents of Erlton South to celebrate the start of summer in the newly renovated Erlton Park. With the help of a $25,000 grant from the Camden County Freeholders, the park received quite a facelift this spring: the Township was able to install new swings, exercise equipment, play equipment for children ages 2 to 5, and new landscaping throughout the park. Both the tennis court and softball field were resurfaced, and new tennis, basketball and hockey nets were installed. Mr. Softee treated guests to a few sweet, summertime treats, and the neighborhood kids had a great time on the J-Dogs moon bounce. Cherry Hill Township is continually looking for ways to enhance our recreational offerings, and we always welcomes residents' feedback. If you have questions or suggestions about a park or playground in your neighborhood, please share them with the Department of Recreation by emailing Recreation@chtownship.com [mailto:Recreation@chtownship.com] . Thank you - and have a great summer!